The participants to the National Alliance for the Self-Determination Right of Catalonia met for the first time on Wednesday in Barcelona, bringing together almost 50 entities, including political parties, business associations, trade unions, social organisations and cultural institutions. This transversal initiative representing a wide part of Catalan society aims to reach an internal consensus on how to proceed in order to organise a self-determination vote in Catalonia and allow citizens to decide on their collective future, especially regarding the potential independence from Spain. The participants represent the main political parties and civil society organisations in Catalonia, although significant exceptions are noted, in particular the Catalan Socialist Party (PSC) – which is part of the Spanish Socialist Party (PSOE), supports self-determination but considered the meeting was biased – and Foment del Treball, the association of the main business owners. However, representatives from other important business associations and Chambers of Commerce were present. The political parties present at the meeting represent 64.5% of the Catalan Parliament. 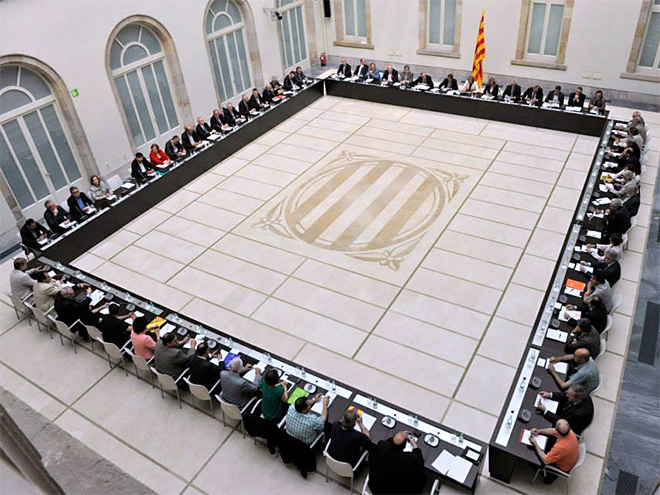 In their constitutive meeting, the attendees agreed to ask the former President of the Catalan Parliament, Joan Rigol, to come up with a text expressing the “common denominators” of the participants as a base to start discussion in order to build a wide consensus, as was explained after the meeting by the Catalan Minister for the Presidency, Francesc Homs. In addition, Homs also announced that the President of the Catalan Government, Artur Mas, will send a letter to the Spanish Prime Minister, Mariano Rajoy, explaining “the echo of the initiative” and making the formal petition to organise a self-determination vote in Catalonia. Homs also underlined the will “to make things based on dialogue, negotiation, the rule of law and the current legal framework”.